Despite founding the Chinese Communist Party, Chen Duxiu receives less attention than his successor, Mao Zedong. A towering influence during the May Fourth Movement, Chen was frozen out of the CCP by Stalinist elements, dying in obscurity in 1942. Chen Duxiu was born in the town of Anqing in Anhui province in 1879. His father, a scholar-official and member of the local gentry, died when Chen was an infant leaving Chen in the care of his strict, traditional grandfather. Chen followed the normal course of Confucian Studies for you and passed the local level of the imperial exams in 1896. Chen traveled to Nanjing in 1897 to attempt the next level of exams, but was completely disgusted by the experience. Spending nine days living in a small dormitory with fellow test takers, he saw the psychological damage the test was doing to his neighbors and began to doubt the effectiveness of the exam system. After failing himself, Chen decided to leave the exam system behind for good. He turned his studies instead to the work of Kang Youwei and Liang Qichao. Map by Croquant via Wikipedia. Like his new idols Kang and Liang, Chen decided to continue his studies in Japan. There Chen became radicalized, cutting off his Qing-mandated queue, but was soon deported for aggressive behavior towards Qing agents in Japan. Back in China, he briefly joined an anti-Qing assassination squad. Chen soon decided, however, that China’s problems went deeper than the ruling dynasty. He returned to China to try and transform the Chinese way of thinking, to get at what he perceived as the root cause of China’s weakness. Chen moved to his native Anhui province and launched a journal, in the mold of Liang Qichao in Japan. Chen’s Anhui Commong Speech Journal was influenced by the same Social Darwinist ideas running through the work of Yan Fu and Liang Qichao. At the same time, Chen founded the Anhui Patriotic Society to help stir up patriotism and military zeal among his neighbors. Issues of the Anhui Common Speech Journal are available online (in Chinese). Unlike the self-strengtheners, Chen contended that what China now needed was not a technological or material fix but a "spiritual" one. The Anhui Common Speech Journal lasted only two years. Chen bounced back and forth between China and Japan as the Qing Dynasty crumbled, waiting for his opportunity to get involved in Chinese politics. In 1915, Chen reemerged on the scene with a new publication. 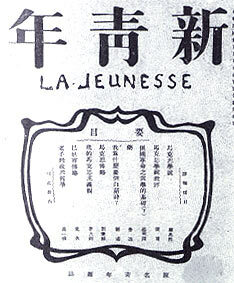 Chen’s second journal, New Youth, became one of the most influential publications for young radicals in this period. Contributors included Cai Yuanpei, Hu Shi, Lu Xun, Communist Party co-founder Li Dazhao and a young Mao Zedong. Chen was able to make New Youth an intellectual and political magnest, a force that had no equal in terms of influencing the up-and-coming generation of political activists. Lu Xun (1881-1936) is one of China’s most celebrated essayist and short-story writers. His writing “was peerless–at once sardonic and sentimental, burning with the idealism of youth in one passage, then cold, bleak and despairing in the next.” (Wealth and Power, page 152). Lu also spent time in Japan, originally to attend medical school. Propaganda of Japanese atrocities in China convinced him to leave his chosen profession and focus instead on curing China’s spiritual ills through writing. Lu was initially reluctant to contribute to New Youth, but eventually was persuaded to submit the story “Diary of a Madman,” Kuangren riji (狂人日记), to the magazine. The story was a sensation, capturing through the metaphor of cannibalism China’s struggle to escape the stifling grip of Confucian tradition. It’s no coincidence that the last four characters recorded by Lu’s madman, “save the children…,” echoed the title of Chen’s journal. Many of Chen’s readers were young, and in youth he saw the opportunity to transform China’s future. 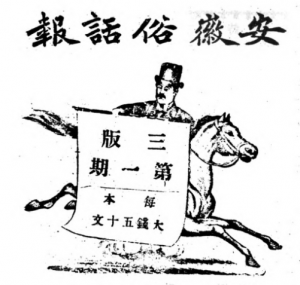 Chen exhorted his readers to fight back against the feudal roots of Chinese traditions, a mantra that would become a tool in the communist party’s standard rhetorical arsenal. Like Liang Qichao before him, Chen preached destruction and replacing the old with the new. The movement that emerged out of the period became known as the New Culture Movement, bringing together like minded writers, philosophers, artists and outcasts to decry the nascent Chinese republic’s inability to get China’s rejuvenation on track. "The Chinese compliment others by saying, 'He acts like an old man, although still young,' Chen wrote. 'Englishmen and Americans encourage one another by saying, 'Keep young, while growing old.'" As the popularity of New Youth grew, Chen expressed a growing interest in democracy. He associated democracy closely with science, going so far as to anthropomorphize the two concepts as heroes of the New Culture Movement, Mr. Science and Mr. Democracy. Like other leaders of his time, however, Chen was pragmatic when it came to his political choices. Chen would support whichever system he felt had the best chance of bringing about the restoration of Chinese wealth and power that he sought. "Critics accuse this magazine of intending to destroy Confucianism," he wrote of New Youth's editorial policies. "These charges are conceded." 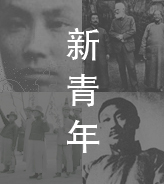 The May Fourth Movement, wusi yundong (五四运动), brought Chen Duxiu to the height of his influence. Chinese intellectuals around the country were sparked to anger by Liang Qichao’s telegram from Paris announcing the secret agreement between the Chinese government and Japan to turn over Germany’s territorial concessions to the Japanese. Already planning to protest the anniversary of Japan’s Twenty-One Demands, several thousand students flooded the Tiananmen Gate at the southern entrance to the Forbidden City. Frustrated and angry, Chinese reformers began to question if any of their liberal ideas were actually leading anywhere. The protesters turned on the closest government official they could find, Cao Rulin, minister of communications for the current ruling warlord, torching his property. The protest spread nationwide. For many Chinese, including Chen and Liang, the West's political ideals, which had led Europeans like lambs to a pointless slaughter, now seemed far less alluring. For Chen, as for Sun Yat-sen and Liang Qichao before him, the May Fourth Movement called the merits of the Western model into question. Disillusioned by the actions of the Allies at the Paris Peace Conference, Chen began to look to other models. The Soviets quickly provided an alternative, sending Lev Karakhan to Beijing and voluntarily returning their territorial concessions. By April of 1920, Chen was organizing the first communist cells in Shanghai. Chen had come around to Sun’s way of thinking: the Chinese people needed the strong leadership of professional revolutionaries to train a new generation of leaders. Not only was Communism “modern” and “scientific,” if provided a world view that allowed Chen and his colleagues to blame the West for China’s current struggles. In July 1921, the Chinese Communist Party was officially born in Shanghai, with a young Mao Zedong in attendance. Chen’s tenure at the top of China’s Communist Party was short. He became uncomfortable with Stalin’s rigid leadership and was soon entertaining “revisionist” thoughts. He was blamed for the failure of the Party to spark revolution in China’s cities and was finally expelled from the party in 1929. As war raged across China, Chen lived in hiding, and saw two of his sons killed fighting against Chiang Kai-shek’s Nationalists. In 1932 he was arrested and charged with being a “Trotskyite” and sentenced to 13 years in prison. Released early on account of poor health, Chen retreated to an isolated village in the mountains of Sichuan, where he lived in obscurity. On his own, Chen’s faith in democracy reemerged as he watched Stalin’s tyrannical nature emerge. Chen also found solace in his classical education, turning to classical poetry and philology. His legacy is complex: he stirred up China’s youth, helped instigate one of China’s most important modern protests, and founded China’s ruling political party. But as a politician he lived with regret, doubting his choices and fearing China would face a long road before becoming rich and strong again. Like those metal allows that possess "shape memory"–they bend when heated, only to snap back to their original shape upon cooling–members of this transitional generation were never quite able to escape the intellectual molds of their childhoods.